TechSpot is dedicated to computer enthusiasts and power users. Ask a question and give support. Join the community here. TechSpot is dedicated to computer enthusiasts and power users. Ask a question and give support. Join the community here, it only takes a minute. Nvidia wants to let people experience the joys of a high-end gaming PC without having to purchase one. At CES yesterday, CEO Jen-Hsun Huang announced that this will become possible, thanks to a new version of GeForce Now coming to PC and Mac. Once logged in, users will be able to load up standard versions of Steam, Origin, Uplay, GoG, or other online stores and purchase games or download titles from their existing library. The games will then run on Nvidia’s GRID servers through GeForce Now. Prices are tied to the virtual PCs’ GPUs. $25 will get you 20 hours on a GTX 1060, while the same amount of money buys 10 hours on a GTX 1080 PC. You'll get between four and eight free hours to start off with, and Nvidia says installing games doesn’t count toward play times. Obviously, GeFoce Now isn’t cheap. Someone using the service for just a couple of hours a day throughout an entire year would probably spend the same amount you'd pay for a gaming PC, especially if they picked the high-end GPU tier. But as the games played on GeForce Now work with online stores’ save functionality, it could be useful when playing graphically demanding games on low-end laptops while away from home. Plus, purchased hours won’t expire if you don’t use them. 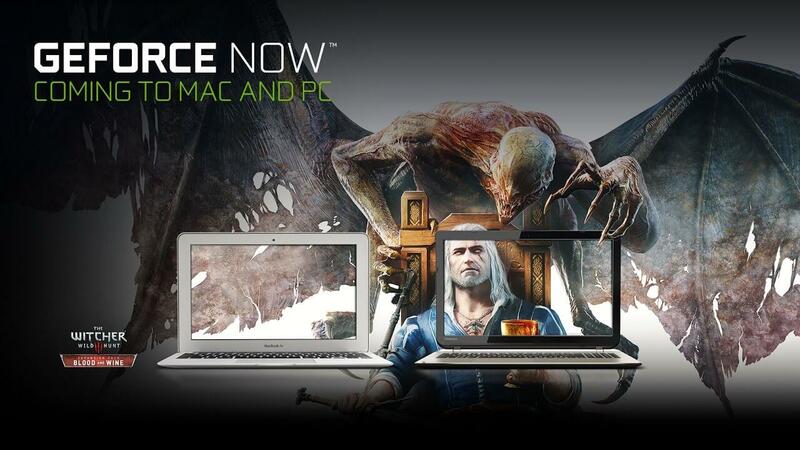 A LinkedIn job ad from last month hinted that an upcoming $10 per month Club GeForce Elite subscription program could include some free GeForce Now hours. For the US, early access to GeFoce Now is set to begin in March. The full service should arrive soon after. bugejakurt and ManuelV like this. Yet another thinly disguised, money spinning scam. That $25 you waste on every 20 hours of gameplay will very quickly add up to you have easily been able to have purchased an actual physical card outright, perhaps two. Without any further consideration, I'll pass thanks. bugejakurt, psycros and Evernessince like this. At these prices you could simply buy a computer on a finance plan. You could buy one interest free and make $30 a month payments. I would never do that - I'm just saying, it makes way more sense. This ignores players interested only in select titles and people who want to play on the go (laptops) without spending money on some faux desktop. Building a $1,200 PC to play one or two games in maximum detail is dumb (financially). Dropping $25-$50 for access to the hardware is sensible. Especially if you have no use for the performance hardware outside of that. Same goes for people who game on laptops. You can fork over 9,000 dollars to Acer or get the same thing streamed to your Chromebook for 50 bucks. wastedkill and VitalyT like this. If you want to check out some new titles, it makes sense paying $25 once and forget about it, rather than upgrading your video card, or even getting a whole new PC. wastedkill and hahahanoobs like this. I agree, not a scam. I do wonder how large the market actually is though - I suspect 'not very'. It makes sense if you want to try a game that you would need to upgrade for, before you actually upgrade, but that is really all I can think of. If you're gaming on-the-go a lot, you're probably going to invest in a decent gaming laptop, rather than be at the mercy of an unfamiliar network connection ('hotel broadband', 'Grandparent WiFi', etc). If you're trying to 'game-on-the-cheap', you are probably just going to buy console (the perception is they're cheaper - lets not argue if they actually are). At the prices they are charging, it is not a model that someone can justify using in the long run. But if you're looking to just try out a game - through Steam Refund or sharing a library - I can see this as a way to let you try it before you drop $300-600 on a GPU upgrade just to run it. I agree, not a scam. I do wonder how large the market actually is though - I suspect 'not very'. At the CES conference Huang put up a slide suggesting that approximately 1 billion computer users are running on integrated graphics processors. Assuming even a small percentage of that figure are would-be gamers, that's a pretty sizeable market to tap into. From a business standpoint, it makes far more sense than Sony's streaming service, which isn't half bad in my experience. If you're gaming on-the-go a lot, you're probably going to invest in a decent gaming laptop, rather than be at the mercy of an unfamiliar network connection ('hotel broadband', 'Grandparent WiFi', etc). If you're trying to 'game-on-the-cheap', you are probably just going to buy console (the perception is they're cheaper - lets not argue if they actually are). Agreed, but these aren't the markets they're targeting (see above). And what if I want to play a game 10 hours per day? And I even need to buy a game that is additional $40-$60. I will rather spend $1000 to upgrade my PC and play games with decent performance for a couple of years than having to do this. NO THANKS! bugejakurt and psycros like this. For the Weekend gamer like myself (who usually manages 2-4 hours a weekend). This is a pretty good deal rather than shelling out the money for a decent rig. If I were 25-30 years younger I may have have a different opinion. Back when I would do game marathons (20+ hours on a weekend and 4+ any given day). These days I tend to spend more free time with family, friends and household life. This business model has been tried in the past and failed miserably, which strongly suggests the same will happen this time. People are not interested in getting into "services based" applications. If they can do it on their server, they can just as easily modify the graphics card to do the same. I thought nvidia was above such self promoting enrichment ... but they again, it is a new year so perhaps this is their newest business model! This is a good idea at least to see what higher res games look like before making a huge investment in top end gear! While these prices are not cheap. It is cheaper than buying GTX 1080 graphics card(s) and a high end system built around that! I suspect this is largely aimed at Chinese internet cafes where kids already spend crazy money to play WoW or Hearthstone or whatever just for the connection and time on a PC. Now they can add a couple dozen more dollars and play Crysis or Overwatch. If the business model doesn't work, why has Playstation Now expanded to the PC with more titles being added quarterly? Are they selling subscriptions to themselves? A monthly subscriptions is needed without time limit or maybe time limit in peak hours and unlimited in off peak hours, then offer a family subscription that can share 1 or 3 pcs at a time in one account an you may have a winner. Just my 2 cents. Anyway, it is an interesting service. the only problem is affordability and execution. psycros and treetops like this. That would be nice from the consumer side but a terrible move for Nvidia. If they turn it into Netflix for hardware it will undercut their GPU business, defeating one of the purposes of the service: to act as a sales funnel. This is like those "Rent to Own" stores where you end up paying $3800 for a recliner. psycros and Capaill like this. Well if they think that spending $25 a pop is worth it, fair play to them. Personally, I'd never spend a cent on anything I can't eventually own outright... not including amenity bills, taxes and sort of thing of course. It makes sense to some people but this kind of business model has been done to death before, numerous times, but I've yet to see it really succeed. Maybe Nvidia can pull a rabbit out of their butts, they certainly have the financial muscle to back themselves but I see it eventually fading into obscurity like all before them. Some major problems with this. First, $25 - $50 assumes you are only playing 40 hours of content. Anyone dropping money on a gaming laptop is not going to be playing that little. There are games that people spend thousands of hours on. Second, laptops have resale value. Your Geforce service does not. "Building a $1,200 PC to play one or two games in maximum detail is dumb"
And those kind of people buy $100 GTX 1050 or RX 460s. They can also turn around and sell the card for most of it's value back as well. The people who buy $1,200 PCs are not the same people who are even considering this Geforce service. Not to mention that unless you have google fiber, you are not getting anywhere near the same experience as actually having the rig. Internet compression and latency isn't good for gaming. I would like to hear you explain who exactly this is targeted at? Console players? No, too expensive. PC enthusiasts? No, inferior to actually having the rig. Low-end PC players? No, too expensive. psycros, mbrowne5061 and Skidmarksdeluxe like this. There are many reasons for a service like this but the most important one is to make Nvidia a bundle and that's understandable, it's a business after all and it's sole purpose for it's existence. Personally I see it as a ripoff but not everyone does, very understandable as well, in fact to some it could even prove financially beneficial and in that case, it's a worthwhile service to them. Did you skip over every other post I made above? You are looking at the wrong market from the wrong perspective. They are selling this to people running integrated graphics. People who run IG rigs aren't buying cheap graphics cards, by definition. People who want to play modern games in high fidelity but don't or can't spend $700 on a graphics card aren't going to buy a 1050 either, by definition. Moreover, people who spend thousands of hours playing games aren't even going to consider this because they aren't being targeted (as evidenced by the pricing). GeForce Now is being sold to people who are outside of the groups you mentioned. People who don't read tech websites, don't want expensive computers, people who probably aren't even "tech savvy," but want to experience high fidelity gaming. People who buy $400 Wal-Mart PCs aren't going to spend $25 for a day of gaming. They probably have consoles and can expect MONTHS of service for that kind of money. Not sure how you fail to understand that economic reality. It's very simple. I have sales experience. You are all assuming the average consumer is rational. They aren't. The average person who signs up for GeForce Now isn't even going to think about the long-term cost. They're going to see access to a $2,000+ machine for less than $2.00/hr. For some people this is actually a value. For many others it will be a premium. The "economic reality" is meaningless in the real world insofar as sales is concerned. Why do you think so many people go into credit card debt for depreciating assets they don't actually need? Sign up for free, it takes 30 seconds. Already have an account? Login now.